Most golfers don’t concentrate on this section of their golf game near enough, we deem your golf wedges are the most important. Why? Because from 150 yards in is where every golfer, male or female, no matter how good their game is, can be as good as anyone who plays the game. If you have the correct set of golf wedges, in the right lofts and lies, with the right shaft length and flex, all custom fitted to you, you do not require brute strength and/or a high swing speed to master these shots. With technique and practice, the average golfer can compete with the pros and lower their scores. Golf wedges must be THREE to FOUR degrees apart starting with a 48 degree PITCHING wedge-52 degree GAP wedge-56 degree SAND wedge-60 to 64 degrees and up LOB wedges, or any starting loft, as long as there is an approximate 3 to 4 degree gap between each club. Why? Because Loft is distance and on a full swing this gives you a consistent and reliable spread in any distances to be covered. After the full swing distance is accomplished, golfers can swing at different speeds and backswings to cover any distances in between, right down to the nearest foot. BOUNCE, or bounce angle, is the angle inscribed by the leading edge of the golf wedge, the sole of the club, and the ground. In plainer terms, bounce angle is an indication of how much the sole of the club head lifts the leading edge. A high bounce angle (angles of 12–15° indicates a sole which lifts the leading edge significantly, where as a club with little or no bounce allows the leading edge to contact the ground without interference. The purpose of introducing bounce into club head design is to control how easily golf wedges, with their steep angles of attack, penetrate the ground under the ball. A low- or zero-bounce club has a streamlined profile, and the sharp leading edge of the club will tend to cut into the ground readily. When this is undesirable, the use of a club with more bounce will cause the sole of the club to impact first, keeping the wedge from digging into the surface by causing it to "bounce" instead. In practical terms, lower bounce wedges are advised for thin grass and tight lies, whereas those with more bounce are generally employed in deep rough or sand. Typically the range in bounce angles are: Shallow – 0 to 4, Medium – 4.5 to 9.5, Moderate – 10 to 14.5, Heavy – 15 or higher. Our Wishon wedges have a unique zero-bounce grind heel to help make your finesse shots. 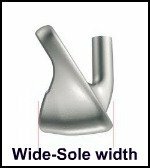 SOLE WIDTH is the measured distance (mm) from the leading edge to the farthest rear portion of the sole (trailing edge).The sole width combines with the bounce to magnify or reduce the effect of the bounce as the sole travels through the sand or turf/ground. A narrow sole is better from firmer ground; wide soles are helpful in getting the ball airborne from softer ground. The wider the sole, the more the effect of the bounce angle is magnified. The more narrow the sole, the less the effect of the bounce will be. A quick guide to sand golf wedges: Deep Sand, Finer/Fluffier Sand (less sand resistance to the club head) use a Sand Wedge with a wider sole or more bounce sole angle or both together. Shallow Sand, Coarse/Grainy Sand (more sand resistance to the club head) use a Sand Wedge with a more narrow sole, less bounce sole angle, or both together. The USGA revised the Rules of Golf, by placing new restrictions on the cross sectional area and edge sharpness of golf club grooves. with the exception of drivers and putters, and limit groove edge sharpness on clubs with lofts equal to or greater than 25 degrees (generally a 5-iron and above). The revisions are designed to restore the challenge of playing shots to the green from the rough by reducing backspin on those shots. The rules apply to clubs manufactured after Jan. 1, 2010. Clubs manufactured prior to Jan. 1, 2010 that conform to current regulations will continue to be considered conforming to the USGA Rules of Golf until at least 2024. 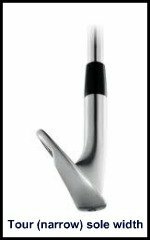 This includes clubs purchased after that date from manufacturers' existing model ranges, so long as these clubs continue to be conforming, they may be used for establishment and maintenance of USGA Handicap Index. WHICH WEDGE TO CHOOSE ???? What most golfers don’t know is that choosing golf wedges on the basis of the design and condition of the course(s) they play is very important for getting the complement of wedges that improve their ability to “get the ball up and down” more often. Longer grass and softer turf around the greens as well as the more “creeping grasses” like Bermuda and Kikuyu found in hot weather climates, the wider the sole and the more bounce sole angle your wedges should have. Likewise, the shorter cropped the grass or more firm the turf around the greens, the less bounce sole angle and/ore more narrow the sole should be on the wedges. The fluffier and/or deeper the sand in the bunkers, the wider the sole and/or the more bounce sole angle will be required on the sand wedge. Conversely, the more coarse and shallow the sand, the more narrow the sole and/or the less bounce sole angle you should have on your sand wedge. These points are true because the wider the sole and more bounce on the sole, the more the sole can resist traveling deep into the sand. In addition, the golfer’s swing technique for sand shots is very important to evaluate. The more steeply the wedge is swung down to the sand, the deeper the sole could dig under the ball. Hence the more steep the golfer’s angle of attack, the wider the sole and/or the more bounce should be on the sole of their sand club. Of course we recommend Tom Wishon's golf wedge heads in his Tour and Wides Sole models. These traditional sole wedge designs, with milled face and micro-groove scorelines are destined to become a classic. Click on either of the images above for a more in-depth look at these heads.